Grassington is a wonderful market town situated in Wharfedale in North Yorkshire and is surrounded by limestone scenery. Grassington was granted a Royal Charter for a market and fair in 1282 and the market was held regularly until 1860. Grassington only started to thrive during the late 18th and early 19th century. The opening of the Yorkshire Dales Railway to nearby Threshfield in 1901 brought many new visitors who settled and found work in Skipton or in the developing limestone quarries. Linton Falls on the River wharfe, just south of Grassington, can be reached from the back of the car park. The falls are spectacular and in 1909 a hydroelectric plant at the falls supplied Grassington with its first electricity and operated until 1948. The plant is now being restored, through an English Heritage project, using two Archimedean screw turbines to produce 510,000 kilowatt hours per year. Today Grassington is a popular tourist place and centred round its cobbled square are a good selection of shops offering food, drinks, clothing and gifts. There are three pubs the Black Horse Hotel, the Devonshire Hotel and the Foresters Arms all of which have accommodation along with some guest houses and there is the Tourist Information Centre in Grassington car park. Hebden is a small, quaint village approx 2 miles from Grassington with the River Wharfe flowing just to the south. Like Grassington the opening of the Yorkshire Dales Railway brought visitors and holiday makers so a timber built guest house opened up in 1909 to cater for the new demand and the business continued until 1990 which by then was mainly for school parties. Hebden is now very popular with walkers and cyclists and the villages of Appletreewick, Burnsall, Thorpe, Linton and Grassington are within easy walking distance. For such a small village it houses a church, a chapel, a community hall, a post office and general store, a pub called the Clarendon Hotel and a good bus service. At the south end of Hebden there is a popular landmark the wrapped steel-cable suspension bridge built in 1885 by local blacksmith William Bell and the footpath on the other side follows the River Wharfe to the beautiful village of Burnsall and Bolton Abbey. 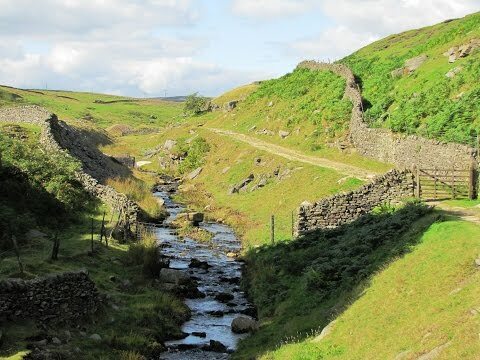 To the north, where Hebden straddles the main road, the narrow tarmac road leads to the small hamlet of Hole Bottom and then continues on a track to Grassington Moor and the old lead mine workings where lead mining became important from the 17th to the 18th century. The mines employed 170 people and between 1821 and 1886 more than 20,000 tons of lead was produced. The lead mining ended in 1880 when the reserves began to drop and cheap lead was imported making lead mining uneconomic. In 2006 Hebden was designated as a Conservation Area by the Yorkshire Dales National Park Authority. We park in the car park at Grassington then walk to the back of the car park and take the footpath down to the River Wharfe, Linton Falls and the bridge. Here we turn right for a short way to have a look at the weir and the two Archimedean screw turbines. We then walk back to the falls and follow the grassy path, the Dales Way, through two fields then turn right onto a tarmac road with a fish farm on the left. We go through a gate and follow a stone footpath then a grassy track, still on the Dales Way, straight forward with the river on our right. When we reach the suspension bridge and the stepping stones over the river we turn left up to the road. At the road we turn right and cross over a little bridge and take the footpath immediately on the left sign posted Hebden 1/2 mile. With Hebden Beck on our left we follow the path between two houses then on a path through the trees, through a field, over a small foot bridge with a waterfall on the right, through another field, over a footbridge and then slightly uphill through another field until we reach the road. Here we turn right and follow the road past the tea shop and the village stores and then cross straight over the main road, the Clarendon Hotel is to the left, and we follow a narrow tarmac road. Hebden Beck is on our right, we pass a small bridge, and carry on following the road to Hole Bottom and Jerry and Bens Holiday Cottages. Here we turn right through a gate and over the bridge the river is now on our left. We keep following Hebden Beck along a track until we reach some old lead mine workings. We now go through a gate and after a short way we see two gates on the other side of the beck, here we cross the beck and go through the gate straight ahead, not the gate on the right, and follow the grass track uphill between two walls. The track bears to the right and then sharply to the left following a wall on the left. We then go through a gate and walk between two walls and into an open field. We cross the field and go through the gate onto a track which goes to the right of a farm we can see in front of us. After passing the farm we follow the track which bears round to the right then we pass through a gate on our right sign posted Moor Lane. We pass in front of a television transmitter mast then just before an old building on the left we take the footpath over a stile on the left. We now follow the path through the fields and over the stiles until we reach a lane (High Lane). Here we turn right and follow the lane until we reach the road at Grassington. We now make our way to the main street of Grassington village and back to the car park. This is an easy flat to moderate walk with only a few small inclines and declines. Approx 6.5 miles using OS map OL2. Grassington in the Yorkshire Dales. From the A1 take the A59 to Knaresborough. At Knaresborough take the B6165 to Pateley Bridge. At Pateley Bridge take the B6265 to Grassington. The car park is on the left. There are public toilets and a Tourist Information Centre both are situated in Grassington car park. For refreshments in Grassington there are three pubs, a fish and chip shop, cafes, tea rooms and many shops to browse round. There are also some guest houses. In Hebden there is a tea room, a small combined post office, shop and off licence and a pub.